Providing the solutions to all of your property surveying needs. We have the solutions to all of your property surveying needs - helping homes, businesses and public sector organisations manage their energy efficiency initiatives and statutory marketing requirements. Our qualified team of surveyors have the experience and technical know-how to produce Energy Performance Certificates, Green Deal Advice Reports and Chartered Surveyor Reports. We can assist with ESOS compliance as well as DECs, Legionella Risk Assessments and advice for Landlords on complying with the Energy Act 2011. 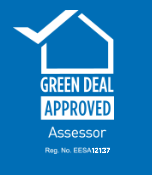 We are an accredited Green Deal Assessment Organisation. Unrivalled expertise to help you realise the energy saving potential of your property. Bierce is managed by a highly experienced Chartered Surveyor and adopts RICS standards throughout. Our team has conducted over 35,000 energy assessments. We train our own assessors ensuring that we have the capacity to deliver quality EPCs and at high volumes if required. Across all of our services, quality is of the utmost importance. We undertake quality control checks at each and every stage of our processes. Our team of expert surveyors work to very tight service level agreements and we will always ensure a quick turnaround for our clients, whatever the assignment. Our stringent internal audit process is second-to-none.